The women codebreakers of Bletchley Park are not the only women to have been largely forgotten in our history. Towards the end of the Second World War, just across the ocean, the ENIAC programme was launched. The aim was to build a computer that could perform a set of complicated math calculations in the matter of seconds. Those called upon to programme this machine were six incredible women from different cities and backgrounds across America. Yet, their efforts went unacknowledged when the massive new machine was unveiled to the public by the US Army on 15th February 1946. The names of these women were nowhere to be seen in the New York Times article ‚ÄúElectronic Computer Flashes Answers, May Speed Engineering‚Äù. The Electronic Numerical Integrator and Computer, nicknamed ENIAC, and was the first all-electronic programmable computer. It measured 80 feet long and 8 feet tall. Inside, it contained 18,000 vacuum tubes, and was covered from head to foot in more than 3,000 switches, wires and cables. The machine was built to replace the one-hundred women hired by the US Army during the war to work as ‚Äúhuman computers‚Äù. These women would spend their working days doing repetitive maths equations for missile trajectory programmes. They were needed to calculate how far missiles would go and where they would land. Normally, these calculations would take weeks of scribbling numbers on large sheets of paper to solve by hand. The US Army wanted these calculations to be completed at a much faster rate. WANTED: Women With Degrees in Mathematics‚Ä¶ Women are being offered scientific and engineering jobs where formerly men were preferred. Now is the time to consider your job in science and engineering. Thinking the job would be easy, the engineers decided to recruit women to do the job. The selected six were Jean Jennings Bartik, Marlyn Wescoff Meltzer, Ruth Lichterman Teitelbaum, Betty Snyder Holberton, Frances Bilas Spence, and Kay Mauchly Antonelli. They became known as ‚Äúthe ENIAC girls‚Äù and were set the task of setting up the ENIAC. This was easier said than done as very little information was given to the girls. What the machine was and what it would be used for they did not know. The machine itself was so classified that the girls were not even allowed to see it until the nearer the time it would be unveiled to the public. Kay remembers, ‚ÄúSomebody gave us a whole stack of blueprints‚Ä¶ and they said, ‚ÄòHere, figure out how the machine works and then figure out how to programme it.‚Äô‚Äù Working almost blindly, the six programmers spent¬†the next few months programming the entire machine. What Jean, Marlyn, Ruth, Betty, Frances, and Kay did was revolutionise computer programming. They helped lead the world into the digital age. Yet, despite this amazing accomplishment, their efforts were unacknowledged until 1997. This was the year all six women were inducted into the Women in Technology International Hall of Fame. These women were the American version of the Bletchley Girls, and should be acknowledged alongside them as some of the world‚Äôs first digital programmers. 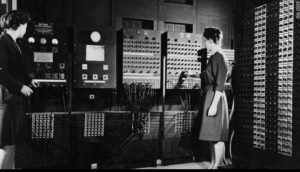 You can read a¬†short article on the ENIAC programmers by Kate Schatz here. The ENIAC programmers have their own website that features a short documentary film about the six programmers, whilst CNN has written a feature on the topic.